Check out our Cadillac specialty factory radio replacement harnesses! 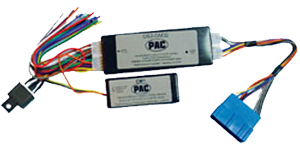 Our model specific harnesses allow you to add an aftermarket stereo CD player into your car without losing any of your current features such as a premium radio system, data bus features or systems such as OnStar. Our harnesses feature the standard aftermarket wire color codes so they will match the wire colors of most aftermarket radios.